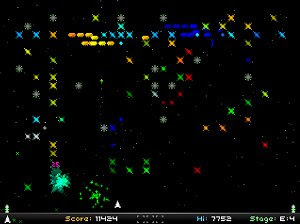 Millenipede is a fast-paced arcade shoot ‘em up originally developed in less than seven days for the 94th “Wednesday Workshop” at SoCoder and is inspired by the Atari classics Centipede and Millipede. I really never thought the game would come this far, but it’s grown into quite a beast and developed a life of its own – nothing groundbreaking, but curiously good fun! Each dead millenipede will, for some environmentally friendly reason, grow into a mushroom (or other piece of debris). These serve no purpose aside from blocking the movement of other millenipedes and hindering your bullets. Each mushroom takes four shots to completely destroy. If you touch any enemy, be it a millenipede, spider or snail, you lose a life – but if you can manage to shoot them first then a nice points bonus will head your way.